York is a wonderful place to live. It’s full of things to see and things to do, and perhaps the best thing to do each year is to visit the York Fair. If you’re new to town, visiting from out of town or considering moving to York and making this wonderful place your new home, you won’t want to miss this annual event. Here’s a look at all you need to know about the York Fair in Pennsylvania. What Is the York Fair? The York Fair is an annual event that’s been taking place yearly since 1765. Yes, that’s right — the York Fair has been in action for more than 250 years. It’s known as “America’s First Fair,” and it starts on the first Friday after Labor Day. The Fair includes performances, concerts, displays, livestock, games, food, drink and so much more. For 10 days each year, this city comes alive with excitement, activity and fun as the Fair becomes the focal point of York, PA.
You can find all sort of performances throughout the Fair each year. This year’s headliners include Jeff Foxworthy & Larry The Cable Guy (Sept. 9), Lynyrd Skynyrd (Sept. 14) and Thomas Rhett (Sept. 15). While many of the daily performances are included as part of your Fair admission, special tickets are required to see one of these headlining performances. Cost of Parking or Admission for York Fair? Adult admission is $8, and it’s only $4 for a child 6–18 or a college student with an ID to enter. Children 5 and under are absolutely free, and parking is $7. You can also invest in a Fair-long pass, which gives you come-and-go entrance into the Fair for $75. This event annually draws hundreds of thousands of people. Local media, businesses and others will no doubt have giveaways, contests and free parking or admission available by other means. 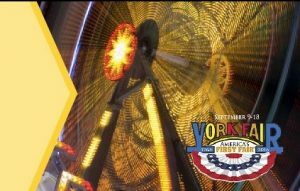 Stay connected and keep an eye out for discounted or free parking or admission to the York Fair. What Should I See, Eat and Do While There? What you should see and do at the York Fair is largely a function of what you’re interested in and what you like. But this historic event is one that offers a unique cross-section of activities, and you should do your best to experience each one. Gates open at 11 a.m. on Fridays and Saturdays and at noon on all other days. Get there early and come hungry, because there’s incredible food to discover. After you’ve eaten, wander through the livestock areas to see the award winners. Then find unique performances that are going on daily. If you have kids, you’ll find many kid-friendly activities including Dinosaur Adventures, a Farm Animal Learning Center and much more. Also, the York Fair annually draws in-demand comedians and musicians. Buy a ticket for one of the headlining performances to top off your York Fair experience. The York Fair is part of the fabric of this city. At CENTURY 21 Core Partners, we love the York Fair and all that makes York a special place, and we also love helping individuals and families find the perfect place to live here. If we can be of any assistance as you search for the right home in York, PA, we’re only a phone call away. Contact us today about finding your perfect home in York.